Learn how the latest business insight, analysis and opinion can help your business. Complete the form below to claim your free demo of the World Molasses & Feed Ingredients Report - it's completely free and there's no obligation. 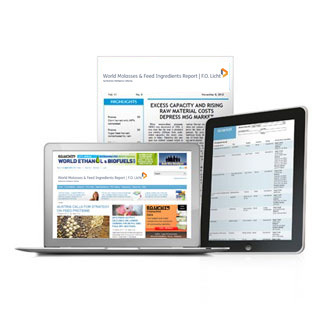 Access to all the latest news, online statistics, forecasts and analysis on the molasses and feed ingredients industry, with a searchable archive of World Molasses & Feed Ingredients coverage. Access to Licht Interactive Data – this powerful search software allows you to locate and interrogate data for over 180 countries. Complete the form below to start your demo. Agribusiness Intelligence. Copyright © 2019 Informa Plc.